Chris Forrester on the ball for Posh against Southend. Photo: David Lowndes. Peterborough United didn’t play with the style seen in recent performances, but they battled away to get a point. 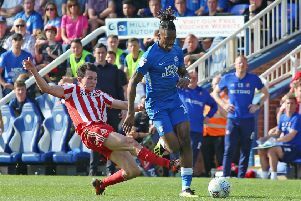 There were some solid individual displays, while Marcus Maddison rescued a nightmare personal display with a great, late equaliser. Paul Taylor in action for Posh against Southend. Photo: David Lowndes. Posh striker Tom Nichols in aerial combat for Posh at Southend. Photo: David Lowndes. George Moncur: (for Nichols, 65 mins). Nathan Oduwa: (for Smith, 86 mins).